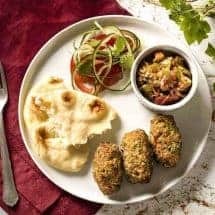 Low Carb Indian Seekh Kababs are a fantastic way to make something entirely different with ground beef. No more ho-hum meatballs. These kababs sizzle with flavor! My favorite ways to each ground beef are Texas Chili, Indian Kheema, and Indian seekh kababs. The first two are a slam dunk for me, especially with an Instant Pot, but good kababs have eluded me for a very simple reason: cook factor. To make good kababs you have to grind the meat well and as I found out when I made the delicious but messy Homemade Gyros, I do not enjoy grinding meat. It’s messy, its sticky, it’s a pain to clean up. So I’ve stayed away from making kababs at home, but every time we go to Indian or Pakistani restaurants, I want kababs. The problem is, they give you 3-4 small little pieces, and charge you $10 for that quarter pound of ground meat. 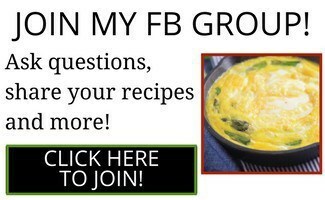 So then one day I posted my gyros recipe on a Reddit Keto forum and complained about the grinding. A few people came on and told me that there was an easier way to do this—using a stand mixer. You don’t need to grind the mixture and get it all up in the blender blades. All you have to do is whack the heck out of that meat. You want to beat it until it’s pasty and sticky. Mmm, sounds appetizing right? Sticky meat? Actually yes. Yes, it does. 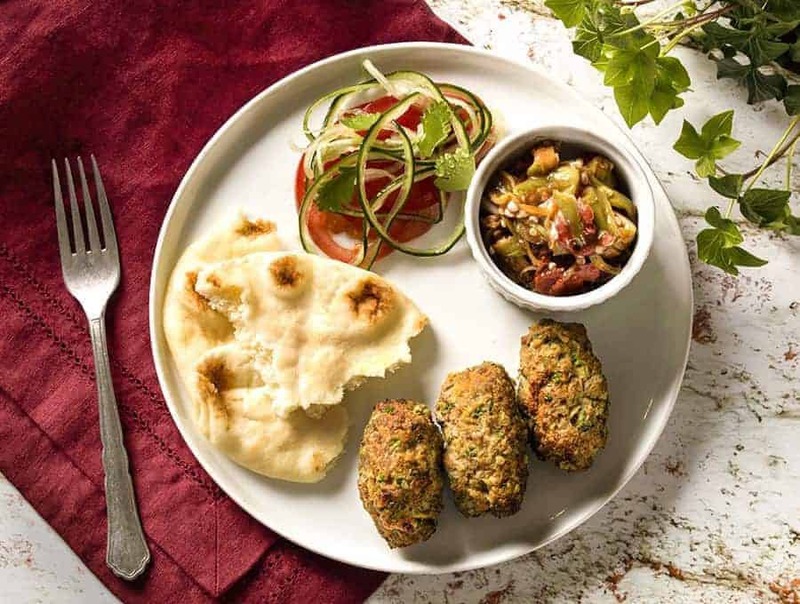 Wait until you make these seekh kababs, which will rival the kababs you’ve had in good kabab restaurants, and you’ll agree with me that it’s worth making a whole pound of Indian Seekh Kababs at home for about $10. So here’s where I cheat. I don’t smooth the meat around the skewers and cook it that way. I just basically make these little sausage things and baked and broiled them. Tell you what, less effort, same taste. What’s not to love? So the recipe is simple. Mix up the meat, onions, herbs, and spices in a stand mixer bowl until it’s all sticky. Wet your hands and make into little kabab shapes. Bake at 350F for 10-15 minutes, finish by broiling. 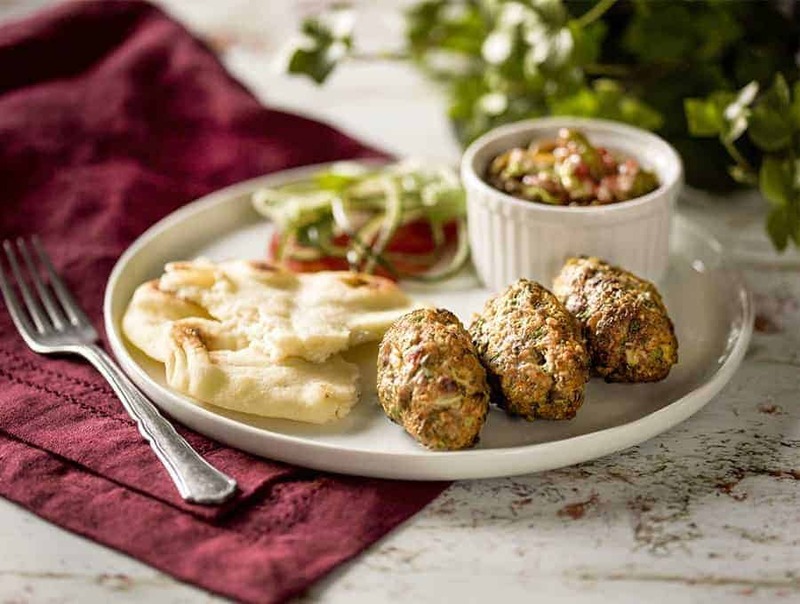 Low Carb Indian Kababs are a fantastic way to make something entirely different with ground beef. No more ho-hum meatballs. These kababs sizzle with flavor! Heat your oven to 350F. Line an oven-safe pan with foil. Choose a pan with a lip as this will hold the grease from the kababs as they cook. Find a trivet or grill large enough to hold the kababs that fill fit into this pan. Mix all ingredients in the bowl of a stand mixer. Using a paddle attachment, blend well until the meat appears somewhat sticky, about 5 minutes. 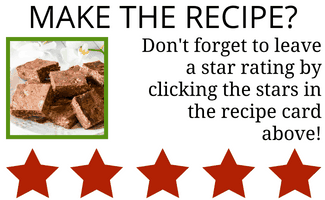 Form the kababs into small sausage shapes and place on the grill/trivet. You're doing this so the kababs are elevated and getting grilled, not fried in fat. Lovely though that sounds, they won't brown if they sit in the fat. Cook for 10-15 minutes until almost cooked, using a meat thermometer to guide you if needed, and then broil them to finish. 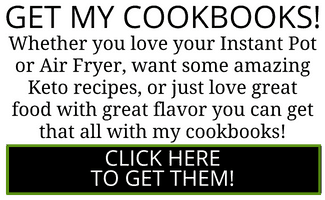 Can I cook these in the Air Fryer I hope to grab at Tuesday’s Morning? I know, it’s Tuesday Morning. Grrr auto-correct! Thanks for your recipe. I love all kinds of kabab. We called this muthi kabab. I’ll try it and will inform you. Will I need to change the settings if I swap the beef for chicken (mince)? My kitchen novice girlfriend made these for me tonight and they are the bomb! She said they were very easy and they’re so delicious. Like a good Greek, I asked for tatziki with them and it paired incredibly well. Definitely will make again, but maybe doubled next time for leftovers! Nothing wrong with tzatziki with these! You might also try indian raita. Same basic ingredients with yogurt and cucumber but no garlic, lemon juice etc. So glad you liked them!